are a type of general election. They are held at regular intervals and fall on off-years from another general election. A famous example of midterms is in the U.S., where around 450 Congressional seats must be reelected in the middle of the president’s term. or special elections, are held when the seat of an elected official is vacated suddenly. If the seat must be replaced immediately, then a by-election cycle will be held so that new candidates can be voted for. Death and impeachment are perhaps the most common reasons for a by-election. 1. When are they held? Midterm elections typically refer to legislative elections that fall halfway between parliamentary or presidential elections. As a type of general election, midterm elections follow a set schedule and occur after a predetermined number of years. By-elections (also spelled bye-elections) are most often called special elections in the U.S. By-elections can happen at any point in the legislative calendar or election season, as they are meant to fill legislative seats that have gone vacant unexpectedly. 2. What is the purpose of these elections? Midterm elections in countries like the U.S. and India are designed for voters to regularly elect representatives. Because the terms of elected officials usually only last a few years, midterm elections serve to replace seats that are vacated naturally at the end of the term. The incumbent, or previously-elected official, may return to their seat if they have not exceeded their term limit and receive a majority of votes again. By-elections or special elections are held when an elected official leaves office unexpectedly and needs a replacement. A common reason for a special election is the death of an elected official. In the U.S., it is notable that the death of a president does not necessitate a special election, as the current vice president is sworn in as president almost immediately after the previous president’s death. Special elections also occur when a representative resigns mid-term, or if a representative is impeached or otherwise forced to resign due to a scandal or criminal charges. In extreme cases, special elections can be held to replace many elected officials or the entire elected governmental body at once (usually due to a case of severe corruption). 3. How long is the election cycle? The midterm election cycle often runs publicly for two years, as a candidate or incumbent may start advertising and campaigning quite a long time before the actual election. Inside a political party, the election cycle can start far earlier. In the U.S., every seat in the House of Representatives goes up for reelection every two years; Senators instead serve for six years, and every two years one-third of Senate seats go up for reelection. This means that two years into the president’s term, nearly all of Congress must be reelected, along with the majority of state governors. This election is considered to be especially critical because it is greatly influenced by the approval rate of the president, and in turn can influence the upcoming presidential election. Because by-elections are sudden, the election cycle usually only lasts a few months to give candidates some time to campaign. Depending on the vacated position, there may be an “acting” official who fills the seat temporarily in order to keep a quorum in governmental affairs. However, by-elections are often unique and the length of the cycle depends on the needs of the specific situation, especially if a criminal investigation of an official is underway. 4. Who can run in the elections? In U.S. elections, any citizen who meets the requirement of the election (age, citizenship, etc.) can run for office. Voters can run under the party they are registered for. In federal midterm elections, however, it is likely that the major parties will support only one candidate from their party within each district. 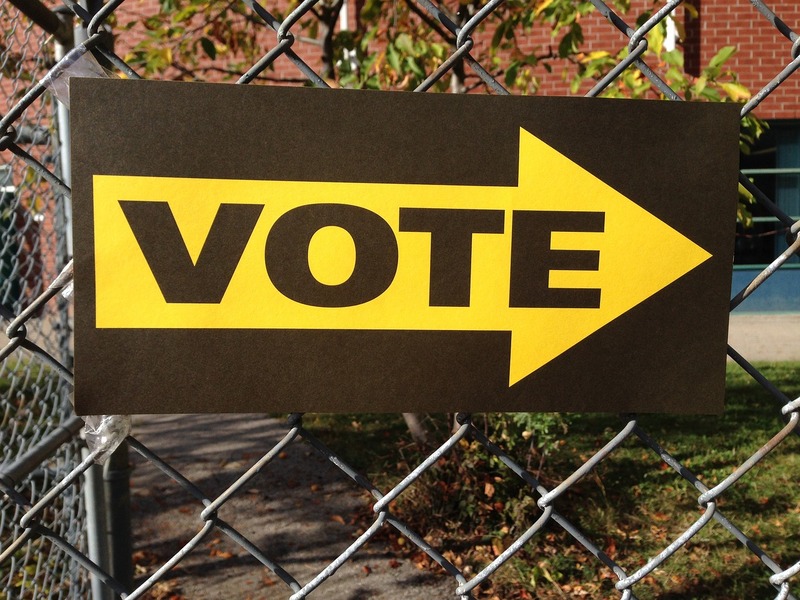 By-elections are usually open to candidates, like in general elections. However, in some countries, a party may choose only a single candidate for the public to vote on, or the party may elect a new official with no public input at all. 5. Who can vote in the elections? Midterm elections have similar rules to all other general elections. Only registered voters can participate in midterm voting. Depending on the style of the election cycle, there may be a “primary” election in which registered party members can vote for a candidate. The winning candidate for that party would then run against the winning candidates from the other parties. In a primary, voters can often only vote within their party, but at the actual midterm election, they can vote for any candidate. This is not the only style of midterm election, however. In many cases, primaries are not restricted by party membership. Also, the U.S. is one of the few countries in which the general public can vote in the primary election – in many countries, parties choose their final candidate internally. 6. Where are these kinds of elections held? A midterm election, under any name, could be held in any country with alternating years of election cycles. By-elections are quite common. Any country that holds an unusually-timed election due to an unexpected circumstance would be considered a country that holds by-elections. Virtually every country that holds public elections could experience a need for a special election. Midterm and by-elections are especially important kinds of elections. They serve very different purposes but can greatly influence governmental affairs. Midterm elections refer to an election that falls between two cycles of another important general election; the most common example is the midterm Congressional election that occurs halfway through a U.S. president’s term. By-elections are not regularly scheduled and occur when there is an extenuating circumstance, like when the current elected official dies or is convicted of a crime. Midterm elections may be open to any qualified candidate who wants to run, and all registered voters can vote for their preferred candidate. In many countries, however, parties conduct midterm elections internally. By-elections in the U.S. may be open to all relevant voters, or could be potentially limited to party members; once again, in other countries, these special elections may be conducted solely by a party or by the legislative body. Kelsey Robarts. "Differences between Midterm Elections and By-elections." DifferenceBetween.net. 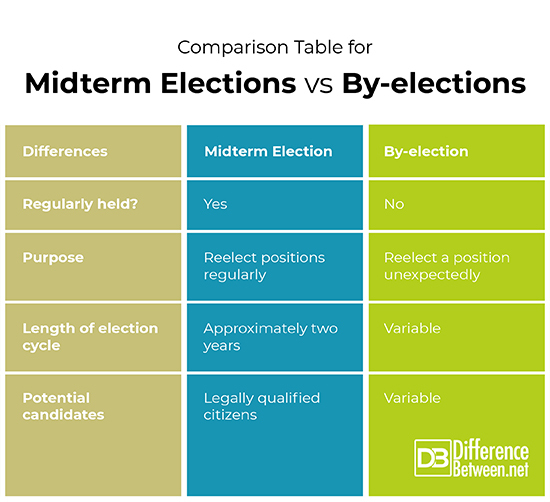 October 4, 2018 < http://www.differencebetween.net/miscellaneous/politics/differences-between-midterm-elections-and-by-elections/ >.